List of parties meeting is seen as a marker of the challenges such a front may face. After a 21-party opposition meeting, Congress chief Rahul Gandhi said it was "very productive" and a "process" to rope in Mayawati and Samajwadi Party chief Akhilesh Yadav was in place. The two leaders, whose relation with the Congress had frayed after seat sharing talks for this round of elections fell through, had skipped the mega meeting held at the initiative of the Congress and Chandrababu Naidu. 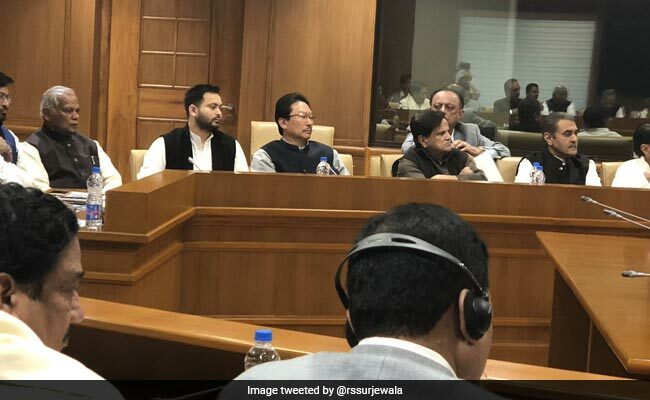 Asked about the participation of the two leaders from Uttar Pradesh -- which sends the largest number of lawmakers to parliament -- Rahul Gandhi said, "It is a process and we will do it in an open and transparent process. We respect all parties, big or small, and want all leaders to be part of this exercise and take on the BJP-RSS and save the country and institutions". Leaders of opposition parties at the Monday meeting. While Mayawati has indicated that her doors are open for an alliance for 2019, both parties appear to be smarting after the seat-sharing talks for the current round of assembly elections fell through. Last month, Mr Yadav said he was "thankful" that there's no alliance with the Congress. " It is because of their faulty policies that the BJP is in power today," Mr Yadav had said. Besides Mr Naidu, seen as the prime mover of the opposition front, his neighbor from south, DMK chief MK Stalin, pitched in to smooth out the creases. Delhi Chief Minister Arvind Kejriwal, whose rivalry with the Congress is as bitter as the one with the BJP, however, attended the meeting. Mr Stalin -- whose party has been a stable ally of the Congress -- today had a meeting with Arvind Kejriwal, where he urged the Delhi leader to end the "negative stance" against the Congress. The country needs a mahagatbandhan (grand alliance) and you have a role in it," Mr Stalin reportedly told Mr Kejriwal. Ahead of the opposition meet, Mr Naidu also had a one-on-one with Mr Kejriwal. DMK chief MK Stalin has pitched in to smooth out the creases. 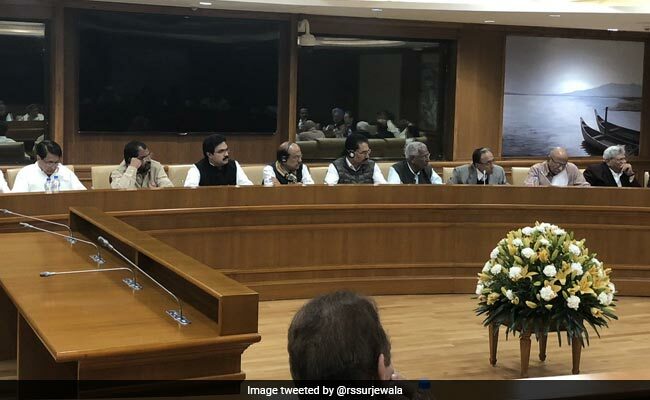 The other leaders attending the meet include Dr Manmohan Singh, Bengal Chief Minister Mamata Banerjee, National Conference patriarch Farooq Abdullah, CPM's Sitaram Yechury, Rashtriya Lok Dal's Ajit Singh, NCP chief Sharad Pawar and Congress's Karnataka ally HD Deve Gowda.